I changed my turn signals to LED light bars the other day. They are completely legal, but the issue I'm having is I can't use my parking lights and turn signals. The bulb that I took out and replaced with the light bar had two filaments, I want the turn signal to work as follows: When the parking lights are on and I apply the right turn signal, I want the right light bar to flash while the left one stays on. And Vise Versa. Except when I do this now the light bar dims a very small amount while the parking light and the turn signal is applied. My Question would be, what do I need to do to get the light bar instead of dimming a little bit to turn off and on while my parking lights are on. I'm not sure if this little explanation made sense, but you can ask if you need more info. Thanks! This can be done with three relays, single-pole, changeover type. Figure 1. Parking light and turn signals. With parking lights off the blue wire is energised. If either turn signal is switched on RLY2 or 3 will click on and off illuminating the lightbar on that side when the normally open (NO) contact is closed. With parking lights on the orange wire is energised. Both lightbars will turn on. If either turn signal is switched on RLY2 or 3 will click on and off disconnecting the lightbar on that side when the normally closed (NC) contact is opened. Note: It is important that the turn signal changes state immediately the switch is moved. This avoids the half-second or so delay that would occur if the turn signal logic is not inverted when the lights are on. This design achieves that requirement. 0.5 s at 72 kph is a travelling distance of 10 m when one car is stationary and 20 m if both are moving towards each other at that speed. That half-second can make a big difference in avoiding a crash. Not the answer you're looking for? Browse other questions tagged dc 12v or ask your own question. 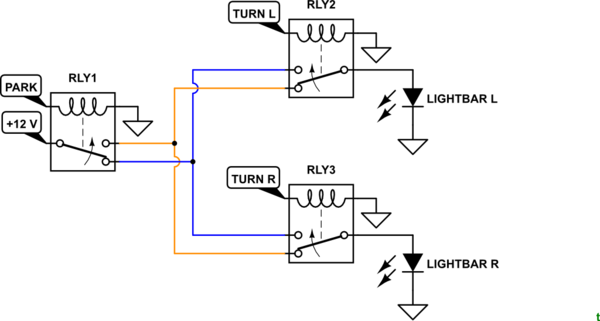 Which diodes for 12v indicator light circuit? How to replace bulb with LED in a PWM circuit (car)? Is this 12 volt LED circuit correct? I keep blowing my SSR. What am I doing wrong here? Do I need a relay for my LED bars?